Protect your vehicle in style. Preserves seats from daily wear and tear. Featuring non-fading design and vivid color tones. Constructed from quality Polyester material and enforced with sponge backing. 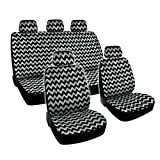 Includes 2 Front Seat Covers set, Rear Cover, 5 Headrest.